The Institute for Economics and Peace just released its latest report, Pillars of Peace. It provides a new conceptual framework for understanding and describing the factors that are associated with peaceful societies. The research is based on an analysis of over 4,000 data sets, surveys and indices; it is the first empirical framework that aims to measure positive peace. Measuring positive peace : Peace is not just the absence of violence, it is much more. Peace is best understood through the concepts of “positive peace” and “negative peace”. Negative peace is the absence of violence or the fear of violence; it is the definition of peace that is used in the Global Peace Index (GPI). Positive peace is the attitudes, institutions and structures, that when strengthened, lead to peaceful societies. 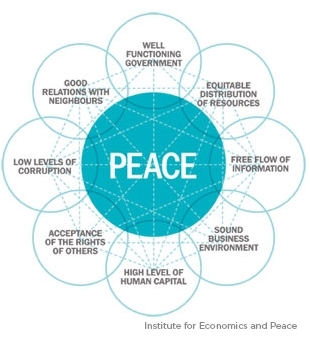 The Pillars of Peace has been developed to measure the positive peace factors that create peaceful societies. These same positive peace factors are positively associated with development outcomes, and the flourishing of human potential. This entry was posted in Fragile States, Human Rights, Peace, Peacebuilding and tagged Fragile States, Global Peace Index, human development, Human Rights, humanity, Institute for Economics and Peace, International Development, Peace, peace research, Peacebuilding, pillars of peace, positive peace, Research, Vision of Humanity, wellbeing. Bookmark the permalink.